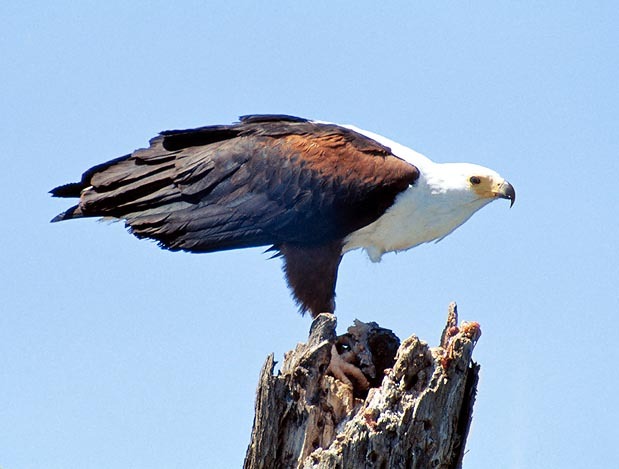 Amongst the great African birds of prey, the African fish eagle, or Screaming eagle (Haliaeetus vocifer Daudin, 1800) is one of the most characteristic, easiest to identify (even for a non-expert of avifauna), and therefore most known. 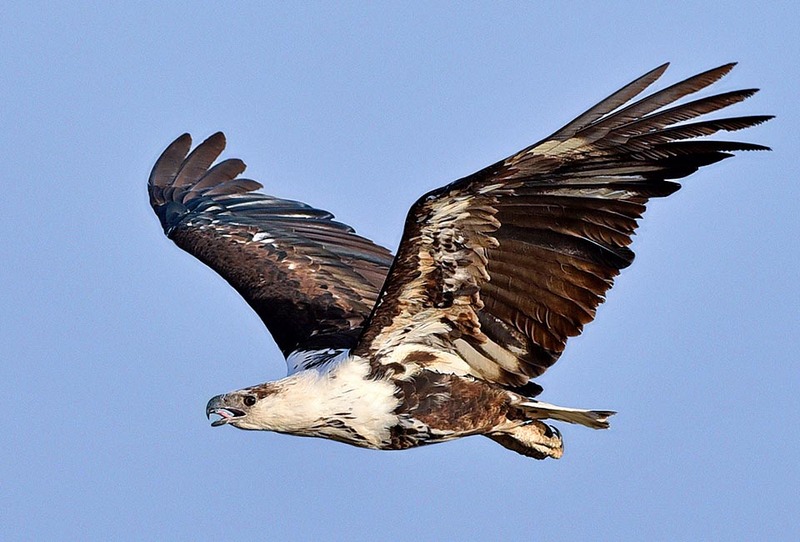 The genus Haliaeetus comes from the combination of the Greek words “hals, halos” (ἁλς ἁλός) = sea and “aetos” (άετος) = eagle, because of the predilection, shown by all the birds belonging to these genus, towards the sea environment or, in general, any aquatic ecosystem, to which they are tightly bound. The specific epithet vocifer has Latin origins, with the combination of the noun “vox” = voice and the verb “ferre” = to bear, referring to the typical vocalisations made by this bird all the year long. A song so particular and recurring that it is identified by all the populations in this continent as “the Voice of Africa”. There is no book, documentary or tale about the wildlife of this part of the World not making a reference to this lamenting and, at the same time, melodious cry which fills the African sky. A sound that shows itself to be unforgettable to anyone having heard it at least once. 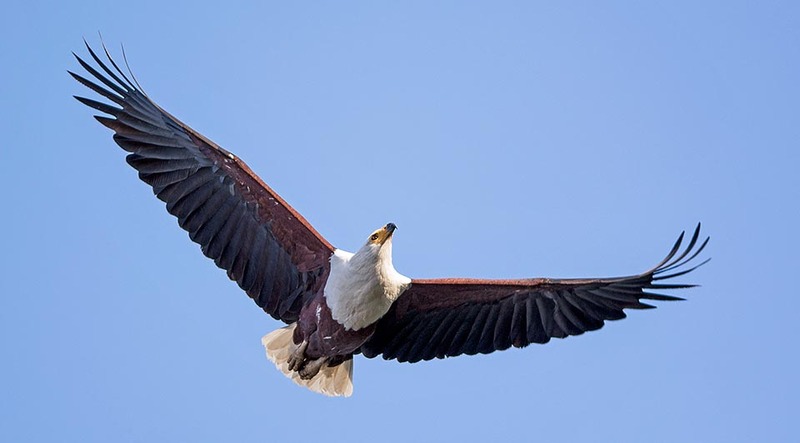 At a superficial glance, it might be mistaken, at first sight, with the American Bald eagle (Haliaeetus leucocephalus), however, apart the existing differences, and the geographic collocation doesn’t give rise to any confusion. The first feature catching the eye is the candid colour of the head, which continues, dorsally, in a V-shaped dot with apex bound towards the tail and, ventrally, in the white of the neck and the chest. If observed from the side, this majestic eagle, while resting on a branch, we shall notice how the dark colour of the junction of the wings and the rest of the body, sneaks in the white with a sort of a sharp ogive. The basic colour of the body and of the upper part of the wings is a more or less light brown with reddish or tawny shades, especially at the level of the belly, whilst the back and the lower part of the wings are almost black. The tail, short and squared, is white. A possible confusion may arise with the Palm-nut vulture (Gypohierax angolensis), an odd bird, who, in reality, is not even really a vulture, and which nourishes mostly of nuts of the oil palms and its habitat, effectively, coincides with the presence of such plants. However, when the above is seen in flight from below, the palm-nut vulture has white belly and wing, and black tail, with only its extremity white, whereby a sure identification is possible. The beak is black, whilst it is evident, at its base, the presence of a yellow “wax”. The wax, present in some species of birds, among which parrots and raptors, is a fat structure usually placed around the nares, which open in the rhinotheca (upper part of the beak), but which, at times, extends remarkably also far from them. In the case of the screaming eagle, the wax includes also the gnatotheca, or mandible, that is the lower part of the beak or rostrum. It surrounds the eyes of this species which usually have a brown colour. Likewise, also the legs and the feet are yellow, equipped with claws apt for seizing the fishes, while flying just above the water. The immature individuals have a different coloration: brown on top, ventrally they are white with scattered dark dots, especially on the belly. 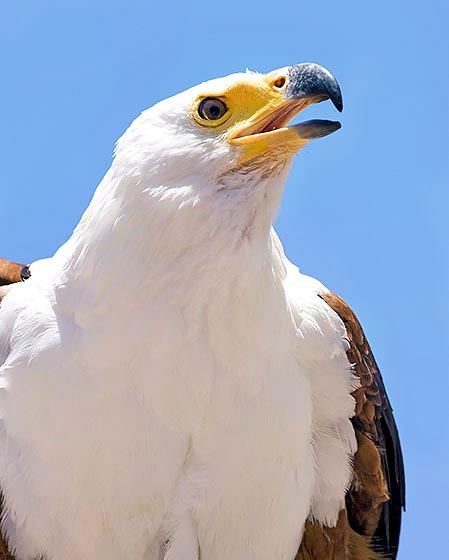 It is a bird which vocalizes a lot, from which comes the name of screaming eagle. The typical cry is a resounding and harsh “Kwow-kwow-kwow”, which begins very loud and then, gradually, subsides. The strong and loud vocalizations are more frequent at dawn. 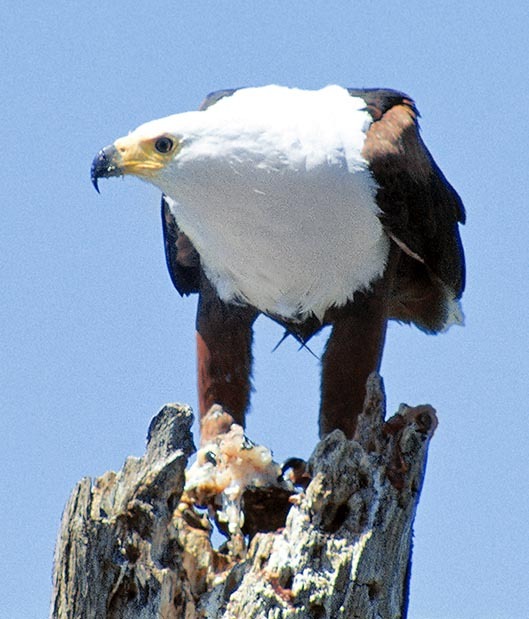 The Haliaeetus vocifer is common in almost all sub-Saharan Africa, close to streams or bodies of water, where its preferred preys abound. It is absent, in austral Africa, from the arid zones, such as the Kalahari, the Great and the Little Karoo Deserts, the Namib Desert and the Skeleton Coast. It is absent also in the zone of the Cape, but the coastal range from Cape of Good Hope along the Garden Route and then along the Wild Coast. The typical habitat is formed by the banks of lakes, pools and ponds, provided with tall trees in the proximities, rivers and soma coastal lagoons, estuaries and river mouths. It is a diurnal bird, living usually in pair. It spends most of the day (85%-95%) on some tree over the water, from which it can fly for catching some fishes. The preferred technique consists in a fast dive. 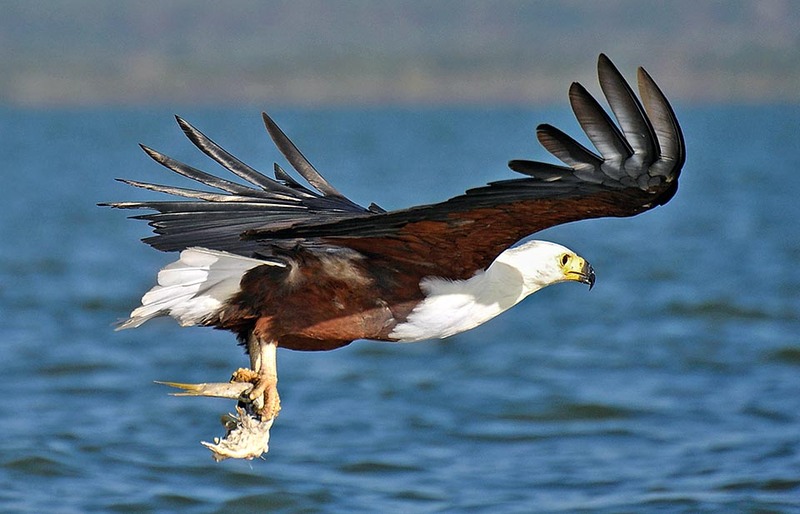 After having sighted the prey from above, followed by a fly over the water’s surface, dredging up the same with the claws, thus leaving a thin wake, for finally seizing the fish, usually when it’s swimming at depths of no more than 10 cm, and then to resume altitude with the prey. Even if this is not a frequent behaviour, I have seen it hovering, taking advantage of the currents and the ample wing surface and in at least two occasions, I saw it literally jumping into the water, like a cormorant, for catching a fish which was a little deeper under the surface. The seized fishes have usually a weight not exceeding the kilogram, but there are exceptions (fishes up to 4 kg). However, fishes of such size cannot be carried away in flight and are eaten on the spot, being its limit of lifting around the 2 kilos and a half. Frequently, it “robs” the fish seized by other birds, especially kingfishers and cormorants, even if the last ones may reveal hard nuts to crack. Once, along the river Luvuvhu, I saw some cormorants attack a fish eagle which had tried to rob their “fishing” and oblige it to fly away. Quite often, finally, it may predate aquatic birds (with a preference for the anatids and the plovers) and their young or robbing and eating their eggs. Other less common preys are the various small mammals living close to the water and in one instance I saw one attacking and killing a young Nile monitor lizard. Other possible preys are; batrachians, reptilians, small monkeys (vervets), hyraxes, eggs and cubs of crocodile, etc. Like the American bald eagle (Haliaeetus leucocephalus), it is attracted by the carrions and does not hesitate in eating them. The reproduction takes place in different periods depending on the latitude and on the rain periods. In South Africa, the peak is in August (dry season, from March to September), in Zimbabwe, in April, May, June and July. This period may drastically change going up, north, towards the Equator. The nest is built with branches, in the shape of a cup or of a platform, even two metres wide, often from 30 cm to one metre, and is covered, inside with leaves, grass and, at times, with the most assorted materials. I saw one of them, close to a village, garnished with pieces of plastic and rags. It is built on a fork of the branches of a plant, at some height from the soil, more rarely on a slope projecting on the water or, lower, on bushes and low trees. The eggs laid are usually two, more rarely three or only one, about 7 cm long, white, at times with small rust-red dots and are hatched for 40-45 days. The nestlings are furnished of food by the mother as well as the male for more than two months, before they may leave the nest, and remain, however dependent from the parents for what the food is concerned still for two months after their first flight. In the case of three eggs, it is rare that all three chicks may survive. Only one, or, at the maximum, two will be able to become adults. 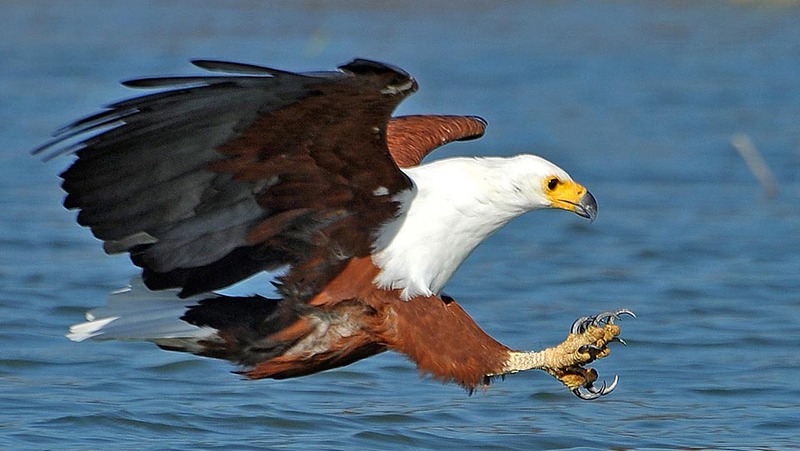 English: Fish eagle, African fish eagle; German: Schreiseeadler; Spanish: Pigargo vocinglero; Portuguese: Aguia pescadora africana, Aguia pesqueira africana, Pigargo africano; Afrikaans: Visarend; French: Pygargue vocifér, Aigle pecheur d’Afrique; isiZulu: iNkwazi (plurale iziNkwazi); Kwangali: Mpungu; Shona: Hungwe; Tsonga: Ngungwa, N’hwathi; Xosa: Unomakwezana, Ingqolane.